Gujarat’s lone female standup comedian, journalist and recipient of the prestigious ‘Laadli Media Award’ draws on her own life experience to talk about women empowerment. Born in a small village in Mehsana, Gujarat, Bhavina went on to become the first differently able person to be one of the top para table tennis players in our country! An internation badminton player and referee at 58, Taraben is truly smashing the age stereotype! At the tiny age of 14, Harsh has designed a smart solution using which drones can not only detect but also diffuse landmines on war fields, saving many lives in the process. Genabhai was infected with polio as a child, but that not stop him from improving the livelihood of the farmers in his village. Today, his village supplies one of the highest amounts of pomegranate and has the happiest farmers! Deep Kakkad is a 21-year old Entrepreneur who has founded 2 startups while in college, he has also helped and worked with more than 30 startups in the capacity of a marketing & growth consultant. The Executive Director at Shah Investors Home Ltd., Dr. Punani is also the Executive Director of Blind People’s Association (BPA). He believes in the inclusion of the differently abled people in the society in order for it to be a better place. Awarded the best RJ of Gujarat, RJ Devaki is also a theatre artist and an active endorser of gender equality. 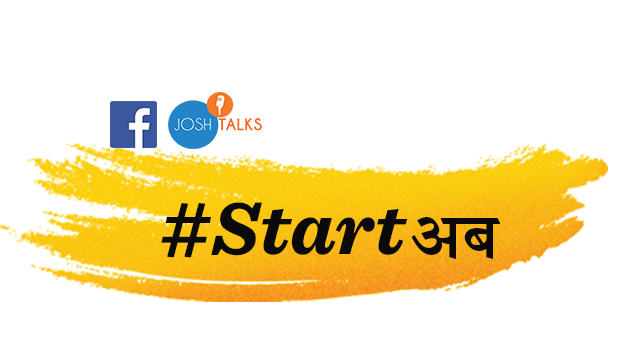 We at Josh Talks, in collaboration with Facebook, are hosting our fourth event of the year on the 21st of January in Gandhinagar. This day-long conference cuts across genres to bring you incredible stories of gritty people who will surely be your next role models. Our line-up features the most accomplished RJ of Gujarat, a Padma Shri winning farmer, a journalist who is also a standup comedian and an International level badminton player who is living her dream at 60 and various other personalities. Uplifting stories and thought-provoking experiences come together to take you on a roller coaster journey of ideas. Join us! 1pm-6pm: You’ll remember it forever. Talks waiting to be explored.